He has published several books, among them The Reality of ESP: A Physicist’s Proof of Psychic Abilities, Limitless Mind: A Guide to Remote Viewing and Transformation of Consciousness and Do You See What I See? 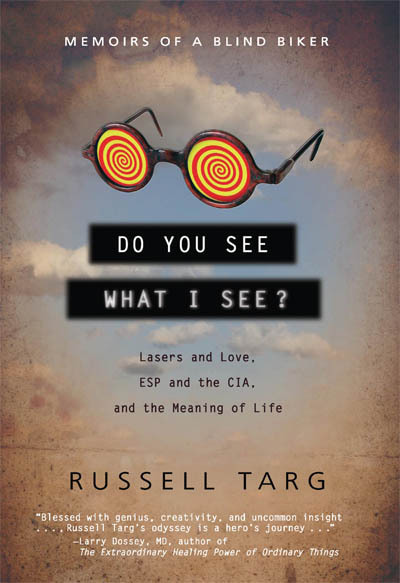 Memoirs of a Blind Biker: Lasers and Love, ESP and the CIA, and the Meaning of Life. He is co-author of other works such as Mind Reach: Scientists Look at Psychic Abilities , The Mind Race: Understanding and Using Psychic Abilities, Miracles of Mind: Remote Viewing and Spiritual Healing. For more information see the following videos (here and here), and an autobiographical essay. Like many parapsychologists, I had a serious interest in magic and sleight-of-hand tricks since the age of twelve. And I had the opportunity to frequently observe close-up magic at Hubert’s Flea Circus on 42nd Street in New York, and purchase conjuring tricks from the professional magic shops nearby. At age fourteen, Robert Rosenthal came into my high school biology class and administered an hour-long introduction to Zener card ESP testing. Rosenthal was a year ahead of me at Newtown High school, and went on to become a distinguished Harvard professor in behavioral psychology. One of the benefits of living in New York City was that in addition to Hubert’s, I could visit the ASPR and become introduced to the professional parapsychology journals, which I received ever since. Because of my very poor vision, I have the life-long experience of trying to make sense of the low resolution images that I experience by way of vision. As a result of this experience, I have paid more than the usual attention to the diaphanous images which come my way through clairvoyance perception. I started having high-quality clairvoyant images in my twenties. These encouraged my interest in psi research. My degree is in physics. But I took courses and read extensively in perceptual psychology. While in college, I was an avid science fiction reader. I remember being thrilled by a number of excellent and engaging novels which sympathetically portrayed telepathic humans. The best of these were Odd John, by Olaf Stapledon; Slan, by A.E. van Voght; and More Than Human, by Theodore Sturgeon. My first papers in psi research were published in 1972. One described an ESP teaching machine, which led to a successful NASA program at SRI. The other was a proposed model for precognition, based on advanced electro-magnetic potential, which is probably not correct. The “ESP Trainer” still lives a free Apple app for the iPhone. The most important thing I learned from my decade with the remote viewing program at SRI was that the accuracy and reliability of precognition is just as great as contemporaneous clairvoyance. The work at the PEAR lab at Princeton supports this important finding. My main interest in psi is to reconcile precognition with modern physics and encourage people to incorporate psychic abilities into their everyday life. I consider precognition to be the senior ability of all perceptual psi. Parapsychology is important because it gives us a window on the fact that we significantly misapprehend the nature of the physical and psychological space in which we live. That is, there is no space-time separation in consciousness. Everyone knows that we can have a dream which may strongly reflect a surprising event that occurs the next day. That is, tomorrow’s event can retro-causally trigger tonight’s dream. For a physicist, if you don’t understand causality, you don’t understand anything. The main problem with the field today is that it is totally disconnected from modern physics. The evidence for psi is much greater than the evidence for String Theory, which is hanging by a thread. But the latter, though perhaps bogus, is presently strongly compatible with physics. When paraphysics becomes physics, we will have taken a great leap forward. For example, hyper-geometry is still considered geometry. I have recently published a book titled, The Reality of ESP: A Physicists Proof of Psychic Abilities. And I am cooperating with the production of a documentary film describing the first decade of the CIA-supported, SRI remote viewing program in the 1970s and 1980s. The film will include interviews with the two-dozen still living people associated with the program. Until this past year, I have been teaching remote viewing in workshops worldwide. 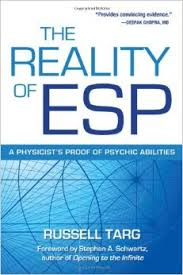 The Reality of ESP: A Physicist’s Proof of Psychic Abilities: (2012), Quest Books. Do You See What I See: Memoirs of a Blind Biker (2008) Hampton Roads. The End of Suffering: Fearless Living in Troubled Times (2006, with J.J. Hurtak) Hampton Roads. 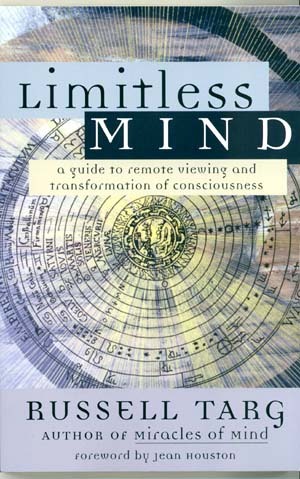 Limitless Mind: A Guide to Remote Viewing and Transformation of Consciousness (2004) New World Library. The Heart of the Mind: How to Experience God Without Belief (1999, with Jane Katra) New World Library. Miracles of Mind: Exploring Nonlocal Consciousness and Spiritual Healing 1998, with Jane Katra) New World Library. The Mind Race: Understanding and Using Psychic Abilities (1984, with Keith Harary) Villard. Mind at Large: Institute of Electrical and Electronics Engineers Symposium on the Nature of Extrasensory Perception (1979, 2002 with Charles Tart and Harold Puthoff) Hampton Roads. 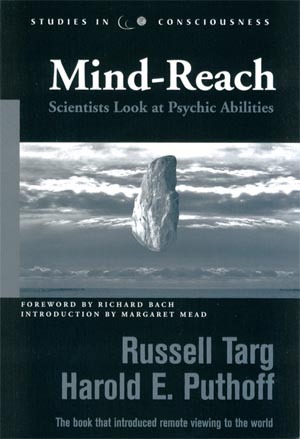 Mind Reach: Scientists Look at Psychic Ability (1977, 2005 with Harold Puthoff) Delacorte. Russell Targ, & Harold Puthoff, “Information transfer under conditions of sensory shielding.” Nature, 1975, 251, 602-607. Harold E. Puthoff, & Russell Targ, “A Perceptual Channel for Information Transfer over kilometer distances: Historical perspective and recent research.” Proceedings. IEEE, 1976, 64, 329-354. 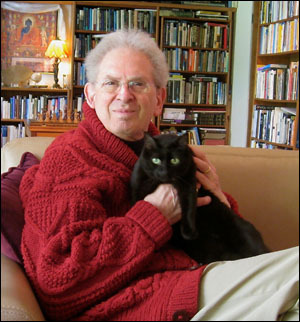 Russell Targ and Elisabeth Targ, “A Study of the Accuracy of Paranormal Perception as a Function of Target Probability,” Journal of Parapsychology, 1986, 50, 17-28. Russell Targ and Charles Tart, “Pure Clairvoyance and the Necessity of Feedback,” Journal of the American Society for Psychical Research, 1985, 79, 485-492. Elisabeth Targ, Russell Targ and Oliver Lichtarge, “Realtime Clairvoyance: A Study of Remote Viewing Without Feedback,” Journal of the American Society for Psychical Research, 1985, 79, 493-500. Keith Harary and Russell Targ, “A New Approach to Forecasting Commodity Futures,” Psi Research, December, 1985, 4(3-4), 79-88. Russell Targ, Elisabeth Targ, and Keith Harary, “Moscow – San Francisco Remote Viewing Experiment,” Psi Research, 1984, 3, No. 3/4, 74-82. Russell Targ and Arthur Hastings, “The Psychological Impact of Psychic Abilities,” Psycho­logical Perspectives, 1987, 18, No. 1 (Spring). Russell Targ, William, Braud, Marilyn Schlitz, Rex Stanford and Charles Honorton, “In­creasing Psychic Reliability,” A Panel Discussion Presented at the 33rd Annual Conference of the Parapsychological Association. Journal of Parapsychology, 1991, 55, 59-81. Russell Targ, “What I see when I close my eyes,” Journal of Scientific Exploration, 1994, 8, 111-118. Russell Targ, Jane Katra, Dean Brown, and Wenden Weigand, “Viewing the future: A pilot study with an error detecting protocol,” Journal of Scientific Exploration, 1995, 9, 367-380. 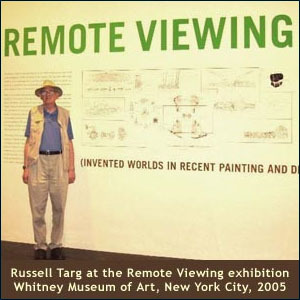 Russell Targ, “Remote viewing at Stanford Research Institute in the 1970s: A memoir,” Journal of Scientific Exploration, 1996, 10, 77-88. Russell Targ, “Remote viewing replication: Evaluated with concept analysis, ” Journal of Parapsychology, 1994, 58, 271-284. Targ, R., Katra, J., Brown, D., and Wiegand, W. “Viewing the future: A Pilot study with an error-detecting protocol.” Journal of Scientific Exploration, 1995, 67-80.